Lovely handmade envelope from a young correspondent. It was rather refreshing to see these frosty leaves on a hot summer day. 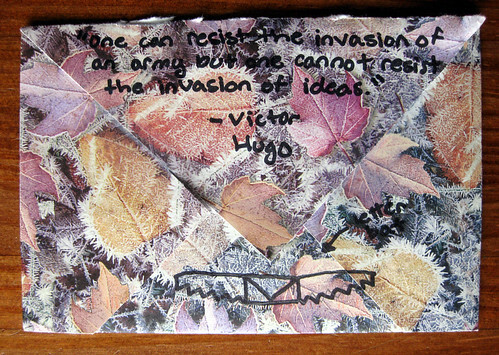 Love the Victor Hugo quote; if you can't see the photo or are having trouble reading it, it says "One can resist the invasion of an army but one cannot resist the invasion of ideas." 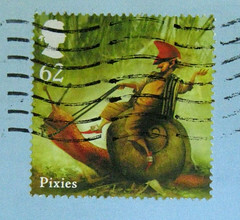 Inside I got a letter bat in pink, tra la. Well, I love quotations and my sister loves bats( her favorite animals or one of them ). So it seems we are both covered. I have a stationary box with a Victor Hugo quote on the inside lid that says " While waiting for the new monuments let's perserve the old monuments". It had some very pretty Blue and white stationary with matching enevelopes in it at one time years ago and the box matches the stationary. It was a gift from my mother for Christmas one year. I keep miscelaneous lables and stickers in it now. i really like quoates too and great letter and great blog .